Spare a thought for our feathered friends this winter. Their survival skills are tested to the limit when winter tightens its grip and food becomes hard to find. During one cold winter's night a bird can use up to a tenth of its body weight keeping warm. Unless it is able to feed well every day to replenish its reserves, a prolonged cold spell can be deadly. Provide a helping hand this winter by feeding your garden birds. Peanuts, black sunflower seeds and nyjer seeds are all rich in fats and oils. Fat balls, cooked rice, uncooked oats, grated hard cheese and finely chopped unsalted bacon are all good but not milk nor desiccated coconut nor salted peanuts. Fruits, including dried fruit and halved windfall apples and pears, all attract in birds. 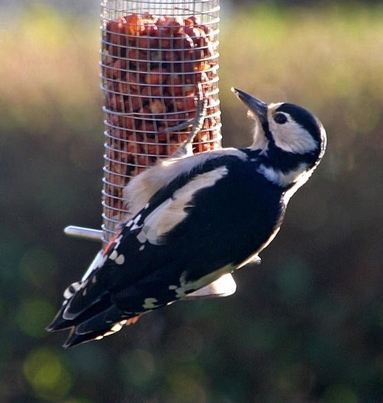 Use a bird table or feeders and avoid scattering on the ground. This attracts rats. Remove stale and mouldy food and reduce the amount offered if it takes days to clear. To avoid the build up of harmful bacteria and parasites clean bird tables and feeders regularly. Remember to provide the birds with access to clean water to drink and bathe in. Bird baths should also be regularly cleaned. Where the humans can get good views, but more importantly where the birds feel safe and can feed undisturbed. In particular avoid putting bird tables and feeders near fences or dense hedges, where cats can easily get to them. If there is a bush nearby, birds can use this as a look-out point to make sure it is safe to come down. Dawn and dusk: first thing in the morning - as they replenish energy lost overnight - and last thing in the afternoon - to prepare for the long night ahead. Grow plants that provide natural food sources for your birds either directly with fruits and seeds or indirectly by attracting insects and invertebrates. Abandon slug-killer and pesticides and increase the amount of invertebrates around for birds to feed on. Grow plants that fruit in winter like holly and ivy. Delay your annual pruning of herbaceous and berry-bearing plants until late winter to provide food and much needed shelter and areas to roost. 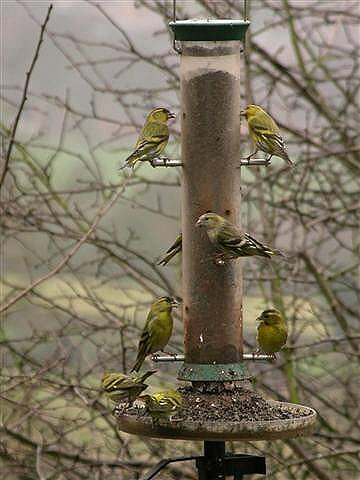 Winter feeding of birds is not only good for the birds but also good for humans, giving us close views of our feathered friends enabling us to better appreciate their wonderful colours and fascinating behaviour.